Arlo Q delivers 1080p video, two-way audio, and 7 days of free cloud storage for up to 5 cameras. 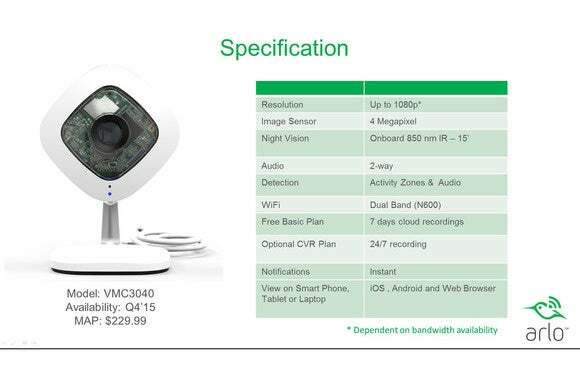 Netgear announced today that it will expand its Arlo line of home security cameras with an indoor model. The $230 Arlo Q, shipping in December, will capture video with up to 1080p resolution and features a built-in mic and speaker for two-way audio communication. The camera is also outfitted with infrared LEDs for night vision. Unlike the original outdoor Arlo, which runs on batteries and powers up only when motion is detected, the Arlo Q will run on AC power and remain active 24/7. When configured to record video when triggered by motion or loud sounds, the dual-band Wi-Fi camera will capture a video clip and upload it to the cloud, where it will be stored for seven days at no additional cost. This free storage is available for up to five Arlo cameras (up to a maximum of 1GB of data). “In our market research, we found that the user experience is negative if the customer gets the product home and discovers there’s an additional fee associated with cloud storage,” said Netgear’s Director of Product Management, Smart Home Damir Skripic in an interview last week. 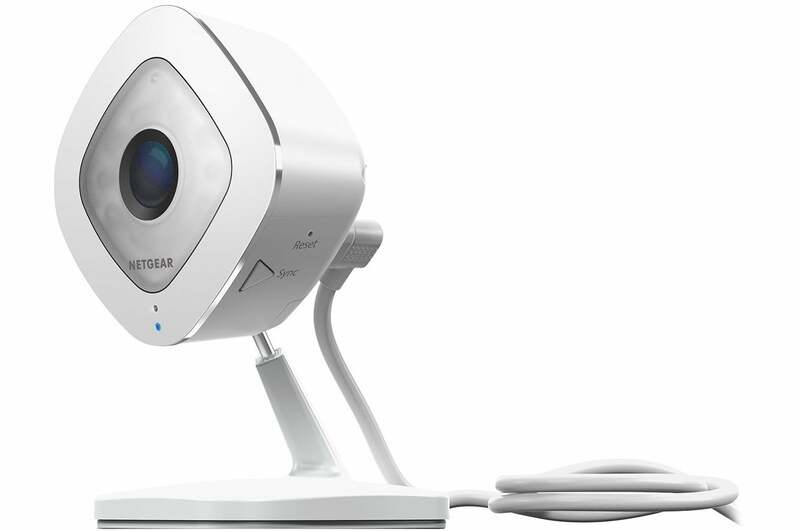 The Netgear Arlo Q's specfications mark should render it one of the top products in this category. A future update will enable the Arlo Q’s motion sensor to be armed and disarmed based on geofencing, so that it’s activated when you leave the area and turned off when you return home (provided you have your smartphone with you). Skripic said this will occur on a first-one-in, last-one-out basis, and that Netgear also plans to add the ability to track devices by user profile. Netgear has developed apps for Android, Amazon Fire OS, and Apple iOS smartphones and tablets, and the camera can send alerts to your smartphone when motion and/or loud sounds are detected. You can also manage Arlo cameras using a web client. Users will be able to define activity zones within the camera’s 130-degree field of view so that motion in certain areas will trigger recording while activity in other areas will be ignored. The camera can also be automatically armed and disarmed according to a schedule. The camera will ship with desktop and wall mounts, as well as a magnetic base that will attach to metal surfaces—such as the side of a refrigerator—without the need for any type of fastener. In addition to the free cloud storage, Netgear will also offer two sets of paid service plans, one for video clip storage and a second for continuous video recording. Netgear’s Premier service plan stores up to 10GB of video clips from up to 10 Arlo cameras in the cloud for up to 30 days at a cost of $10 per month or $100 per year when paid annually. Netgear’s Elite plan expands that to 60 days of storage (up to 100GB of clips) from a maximum of 15 cameras for $15 per month or $149 per year when paid annually. The Arlo Q's magnetic base will provide a quick and easy installation option. Netgear’s continuous video recording plan (the type of service that Nest Labs’ Nest Cam provides for $10 per month) costs $10 per month for up to 14 days of storage, with each additional camera adding 50 percent to that subscription fee ($15 per month for continuous recording from two cameras, $20 per month for three, and so on). In our interview, Skripic described a number of improvements that Netgear is developing for its Arlo line, including cloud-based video analytics that will enable the motion sensors in Arlo cameras to distinguish between a dog, a moving car, and a person; and audio analytics that will enable the camera’s microphone to distinguish between a dog barking and a baby crying. “We believe the scalability of the cloud analytics platform will be the differentiating factor moving forward,” Skripic said.